A look at an abutment on Puente Atenquique II. 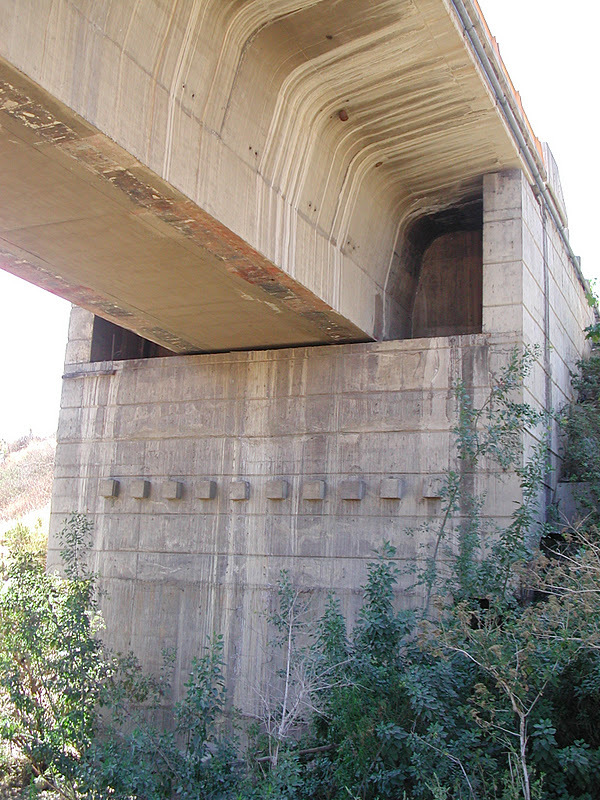 I would guess that this is not the abutment from which the superstructure was launched, because the soffit looks like it rode over eight piers and the end looks like it carried the steel guide. I would guess that the square blocks on the front of the abutment stem wall are decorative although its possible they could have supported some equipment while the bridge was being launched. The shear keys seem slightly ineffective since there's such a big space between the girder web and the keys. The long overhangs would be riding on the top of the keys before the box girder ever got near it. Still that might be sufficient to prevent the superstructure from moving very far transversely. The back wall looks like it is right up against the superstructure which can't be right, unless this is an extremely warm day, which I'm pretty sure isn't true. The superstructure is supported on special bearings with a teflon or stainless steel top surface that allows the soffit to slide with a minimum of friction for the 1/4 mile over the piers. This type of bearing is specially designed for incrementally launched bridges. The nose attached to the end of the superstructure is long enough to prevent large cantilever moments when the span is hanging half-way between supports. Mexico's Bridges: Puente Atenquique II (4) by Mark Yashinsky is licensed under a Creative Commons Attribution-NonCommercial-ShareAlike 3.0 United States License.